The removal of forest cover from much of Cumbria has been carried out over many thousands of years – from prehistoric man to Norse farmers and their medieval successors. Although sufficient woodland remained to provide fodder for livestock and support local craft industries, the demands from growing industrial activity – copper mining and smelting in the Keswick area, iron smelting in Furness, for example – led to an almost insatiable demand for timber and timber products. Whole areas of remaining woodland were systematically cleared, but gradually the need for a policy of forest conservation and management was recognised. New woodlands were planted, and existing supplies safeguarded by the practice of coppicing. How early this process began is not known, but it was certainly well underway in the first half of the sixteenth century. The woodland cover in much of South Lakeland is the result of re-planting in the eighteenth century to ensure a continuous supply of timber for the local iron and forest industries. Coppicing was the practice of producing a “crop” of timber from broad-leaved woodland – oak, ash, birch, hazel and alder. Trees were cut down almost to ground level, and new shoots allowed to sprout from the base. These poles would grow to a diameter of 5-6 inches over a period of 15 or so years, and would then be cut so the whole process could start again. Given 20 or so shoots per stool (stump), and stools 10 feet apart, it has been calculated that the resultant harvest would be around 8000 poles per acre. Most of this timber would be cut dry between November and April, when sap flow was minimal, except for oak where the bark was in demand from the tanning industry, and the rising sap in spring allowed the bark to peel off more easily. The practice of coppicing declined with the demand for its products, although some continues to this day. Bill Hogarth lists the woodlands of South Lakeland in which he worked during the second half of the 20th century : Duddon Bridge – 2 woods; Broughton Mills – 1 wood; Woodland area – 6 woods; Lowick Bridge/Lowick Hall area, including road to Subberthwaite – 7 woods; Blawith – 3 woods; Lake Bank – 1 wood; Coniston area – 2 woods; Tarn Hows – 1 wood of 72 acres; east side Coniston Lake, Brantwood to Water Park – 9 woods; Spark Bridge to Greenodd – 7 woods; Bandrake Head area to Toll Bar – 22 woods; Bouth and Dixons Arms area – 18 woods; Haverthwaite to Holker Hall – 4 woods, one of them 300 acres; Haverthwaite to Rusland and on to Force Forge – 8 woods; Force Forge to Satterthwaite and Dale Park – 4 woods; Wray and Brathay area – 5 woods; Sawrey and Cunsey – 6 woods; Graythwaite Estate -10 woods; Winster – 2 woods; Cartmel Fell to Hodge Hill – 7 woods; Levens Bridge – 2 woods; Meathop – 2 woods; Newby Bridge to Cartmel – 5 woods; Windermere Road from Newby Bridge – 3 woods. A total of 174 woods coppiced, some of them more than once. “The Industrial Archaeology of the Lake Counties” lists many of the uses to which different trees were suited. Oak timbers as beams in buildings and ships, or axles in corn mills; smaller poles split and boiled for barrel hoops and baskets; small branches for high-grade charcoal; and bark for tanneries. Ash for carts, axe and hammer handles. Birch trunks for furniture, mills, carts, ploughs, gates and fences; small branches for hoops, besoms, baskets, wicker hurdles, and all turning, including bobbin-making. Hazel for barrels and baskets. Alder for rollers and charcoal. Bill Hogarth lists a total of 87 different products, including hurdles; oak and alder bark; swill wood; bools; pea sticks; beanpoles; stakes; net and tree stakes; besoms; jump birch; rustic; charcoal; oak roots for flower arranging and fish tanks; morris sticks; hedging stakes; fence posts; binders; firewood; logs; bobbin wood; alder for clog soles; tent pegs; walking sticks. Click here to see a list showing the range of woodland products, and the prices they fetched in 1715. Oak and hazel poles went to hoopers – either locally or in the Manchester and Liverpool areas – to be split, boiled and bent to a circle to fit a variety of barrels, casks and kegs. These were made by coopers, using both timber from standards and from oak coppice, depending on the size produced. The local gunpowder industry alone required 4000 barrels a week at its height. Low Gatebeck mill alone, for example, employed as many as 40 coopers, 12 hoopers, and several sawyers. Swill baskets were produced from a variety of woods – especially oak, but also hazel, willow and larch – to suit a variety of purposes from gathering potatoes in the fields to carrying coal from the mines. Throughout the 18th, 19th and 20th centuries, thousands of swill baskets were exported from the woodlands of South Cumbria, and manufacturing centres such as Bowness, Lowick, Spark Bridge, Torver, Haverthwaite, Backbarrow, and – perhaps most important of all – Broughton, emerged. Small family firms formed the backbone of the industry – a skilled craftsman could turn out 48 baskets in a working week, but this was exceptional. A brush-making industry, centred on Ulverston and Kendal, married local wood for the handles and stocks to imported fibres for the bristles. Charcoal had a vital role as a smelting agent in the production of iron, copper and lead, until coke took over in the 19th century. The iron furnace at Backbarrow continued to use charcoal until the 1920’s, and it was a major ingredient of gunpowder until the 1930’s. 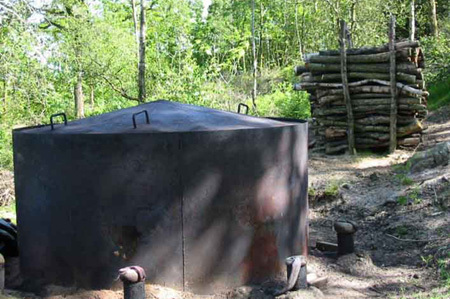 Production continues on a small scale – using metal kilns – for barbeque fuel. In the autumn, a level “pitstead” of 15-30 ft diameter would be cleared or constructed by the “colliers” in the woodland, on which coppice poles in 2-4 ft lengths were stacked around a central pole. At a height of 6 ft, and in a beehive shape, the stack would be sealed with layers of bracken, turf and soil. The central pole was removed, and hot charcoal dropped down the hole left behind to start the burn. That hole was then sealed, and the whole stack carefully monitored over the next few days to ensure a slow burn. Hurdles were erected around the stack to protect against draughts, and any sign of flames were quickly dealt with using water and soil. The stack would gradually shrink to one-third its original size, and the collier could recognise from changes in the colour of its smoke or its smell when the burn was complete. Alternatively samples could be tested for the necessary metallic clink. The earth cover would be removed, the charcoal stack broken open, doused with water and allowed to cool before storage in large sacks. The growth and decline of the bobbin-making industry covered a period of less than 100 years from the end of the 18th century. The industry grew in response to demands of the cotton industry, for which the local coppice wood and abundant water power could support the production of a whole range of bobbins of different sizes and shapes, for different purposes during the spinning and weaving processes. Even a small cotton mill would use thousands of bobbins each year. A typical mill – of which there were nearly 70 in Lakeland and the Lune Valley – would employ 40 people, of whom half would be lathe turners. In the Staveley-in-Kendal area there were 7 mills by 1829, and 193 local people were employed in the industry by the time of the 1851 census. At Nibthwaite (in Furness), two mills were opened in 1834 and 1842, and both had closed by 1885. Spark Bridge mill had 60 hands in 1857, producing 1800 gross of thread bobbins per week, along with other products. At its height in the mid 19th century, Lakeland mills alone supplied 50% of the requirements of the textile industry. Its decline came about through an increasing number of cotton mills installing automatic lathes to produce bobbins on site, through foreign imports, and through changes in machinery in the mills which then no longer needed bobbins made from wood. Some local mills diversified into other wood turnery products e.g. tool handles, but most closed. Now only the working museum at Stott Park near Newby Bridge remains to represent a once thriving Lakeland industry. Howk Bobbin Mill, Caldbeck NY319397 This water-powered mill had one of the largest wheels in the county at 42ft diameter and 3ft width. It dates from1847 and was rebuilt in 1857 as a small mill of red sandstone blocks. The coppice shed is complete although the roof of the main building was lost in a fire in 1958. Rutter Mill, Appleby NY682158 A small rectangular sandstone building, now a barn. It was a corn mill in 1829 and 1851, a bobbin mill in 1894, and a generation plant for the Great Asby Electric Light Co. in the 1930s. Horrax Mill, Stock Beck, Ambleside NY380046 Former bobbin mills, four storeys with internal wheel pit. Machinery sold off in 1964. Original dam remains, as does a coppice barn converted to holiday flats. Stott Park Bobbin Mill SD373883 Probably a corn mill, converted to bobbin manufacture around 1835 and virtually unchanged since.